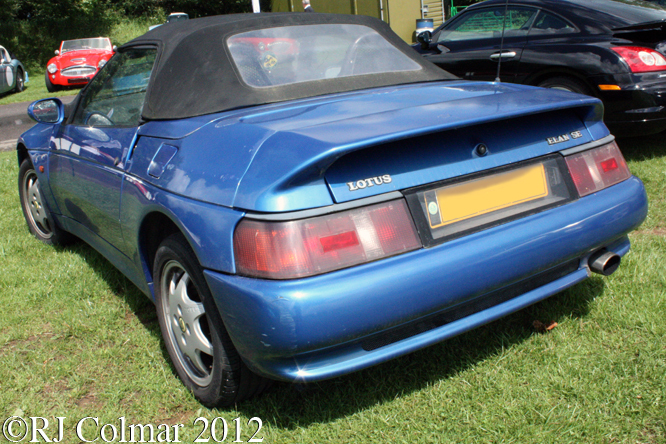 When General Motors acquired Lotus Cars in 1986 it committed to investing £35m / US$55m in to a new affordable car that was to be built on the reputation of the Lotus Elan which was discontinued in 1973. 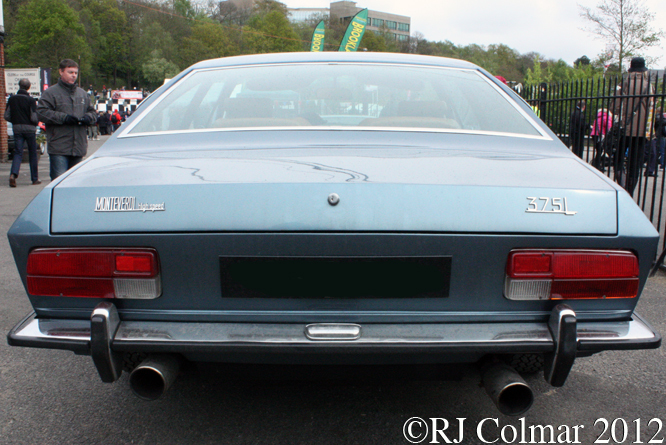 Unlike the original rear wheel drive Elan the new Peter Stevens designed M100 Elan featured front wheel drive, and was powered by a development of an Isuzu motor that produced 130 horsepower in normally aspirated form and 162 hp in SE Turbo form. The rest to 60 mph time of 6.5 seconds and top speed of 137 mph was matched by the handling described by some sources as ‘the finest front wheel drive car bar none’. 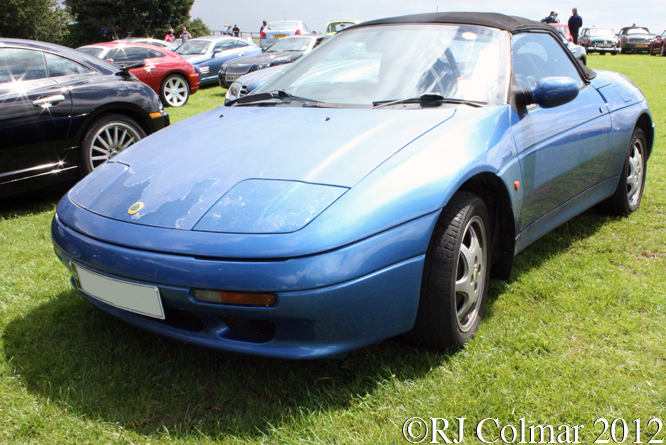 Unfortunately as the Lotus M100 Elan came to market in 1989 Europe and the USA were entering a recession and Mazda had already flooded the market with it’s retro ‘Elan’ the MX5/Eunos/Mita series and so Lotus ended up selling just 3,855 M100 Elan’s between Nov 1989 and July 1992. 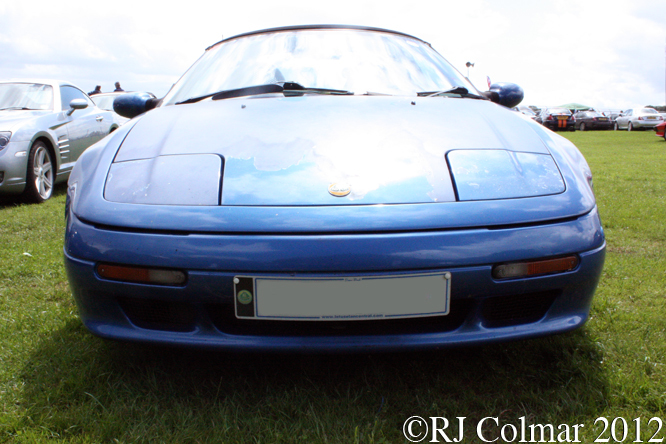 Second series of 800 155 hp Elan’s were built between June 1994 and and July 1995 featuring mandatory catalytic converters and slightly longer and heavier body work to accommodate the latest US spec safety features including airbags. 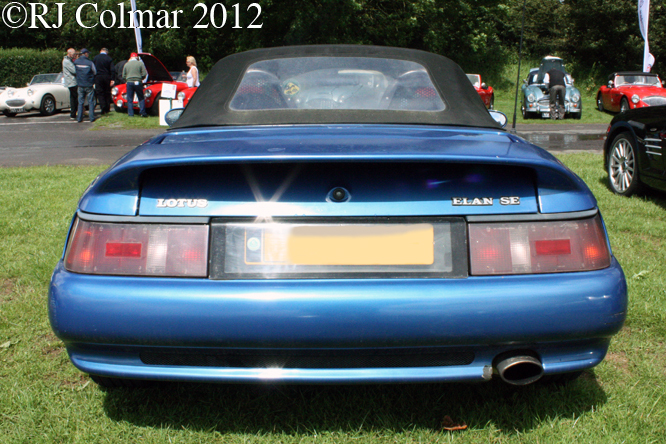 General Motors had sold it’s interest in Lotus to Bugatti by this stage and the new Lotus owners did a deal with Kia Motors to license the manufacture of an updated Kia Elan complete with a Kia sourced power unit. Kia wound up production of it’s M100 Elan in 1999. 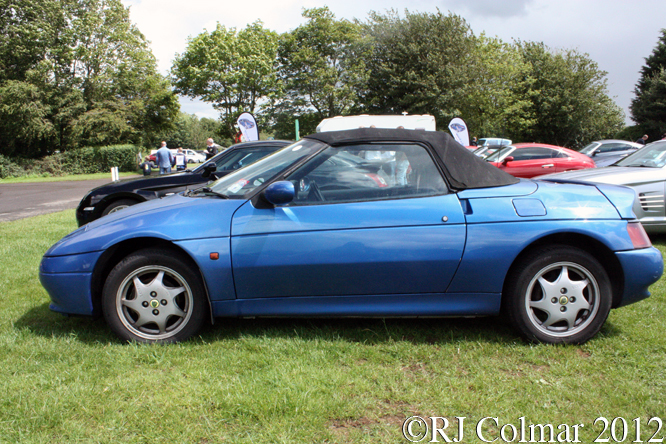 Today’s featured M100 Elan SE Turbo seen at last years Classic Sports Car Action Day at Castle Combe was built in 1991. Thanks for joining me for this “Worlds Best Handling FWD” edition of “Gettin’ a li’l psycho on tyres” I hope you will join me again tomorrow. Don’t forget to come back now. This entry was posted in Uncategorized and tagged Action, Bugatti, Castle, Classic Sports Car, Colmar, Combe, Day, Elan, GALPOT, General, Isuzu, Kia, Lotus, M100, Motors, Peter, Ralph, SE, Stevens, Turbo on March 9, 2013 by Ralph. 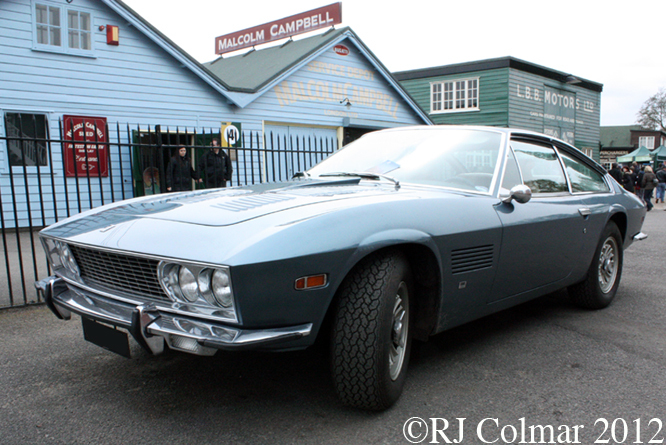 At the end of the 1960’s and beginning of the 1970’s there was no shortage of choice in the Luxury 2+2 automobile market segment from the UK alone came the Chrysler powered Bristol 411, for the traditionalist, the similarly powered Jensen Interceptor for the futurist and the Aston Martin DBS for the international man of mystery. 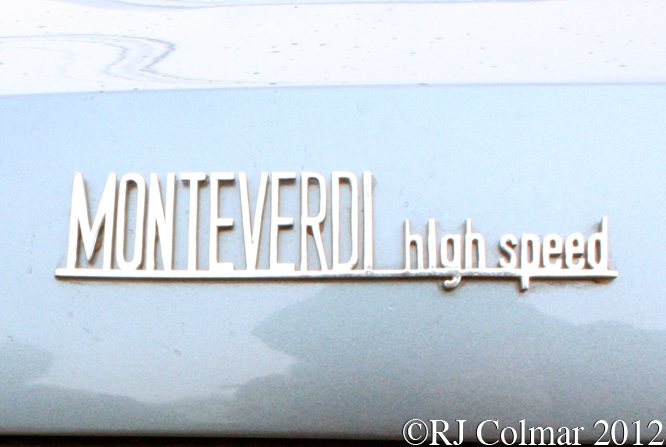 Contemporary to the desirable vehicles mentioned above was the Monteverdi High Speed 375L a 2+2 Coupé designed originally by Fura who built two examples before an acrimonious split left Monteverdi taking his business to Fissori. Fissori redesigned coupé and delivered complete bodies to Monteverdi in Basel in Switzerland for final assembly. 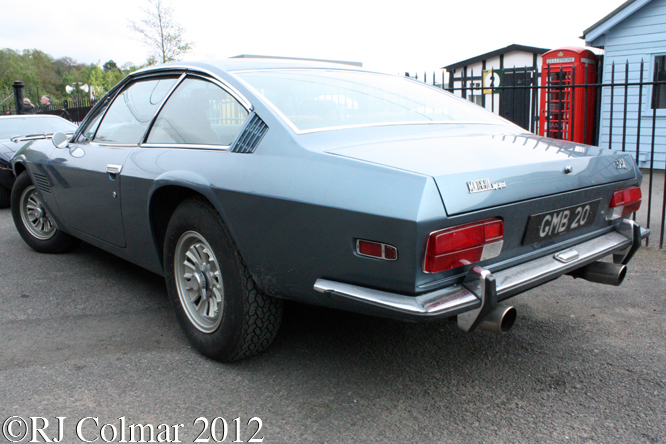 Power for the Monteverdi High Speed 375L was provided by a 375hp 7120cc / 440 cui Chrsyler Magnum similar to those being used for the Britol 411 and the Jensen Interceptor. Peter Monteverdi designed his first car, a special, when he was just sixteen and had it ready to roll in time for his eighteenth birthday when he was allowed to drive it. There were three versions of the 375, 375L like the coupé seen here, 375 S a short wheel base 2 seater and 375 C a short wheelbase drop head also known as the “Palm Beach”. 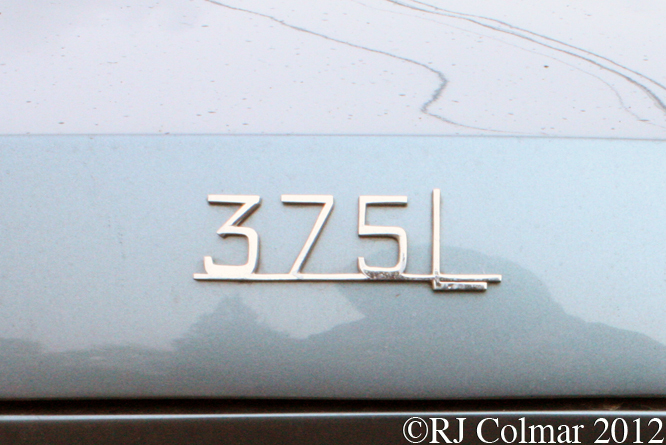 Around 30 375 4 door saloon / sedans were also built. 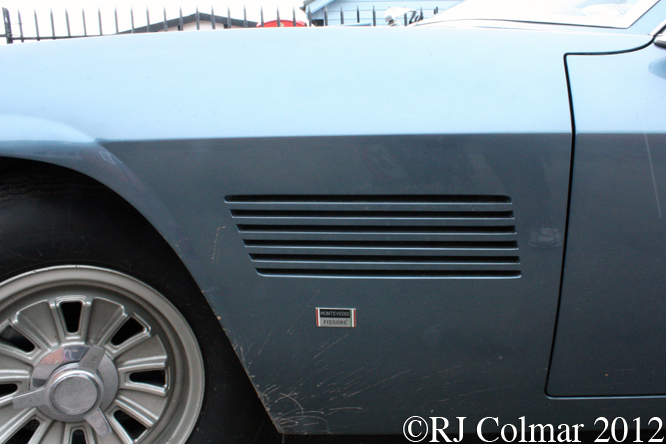 The 375 L was continuously upgraded from 1967 to 1976 when Monteverdi stopped making luxury cars and started making “boutique” using proprietary motors and chassis around which to build his creations. 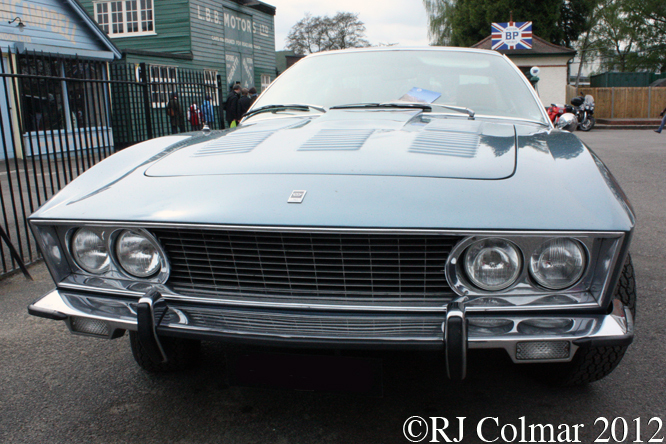 The vehicle seen here at last years Auto Italia at Brooklands was built in 1972. Thanks for joining me on this “Designed By Fura Built By Fissore” edition of “Gettin’ a li’l psycho on tyres”, I hope you will join me again tomorrow. Don’t forget to come back now ! This entry was posted in Uncategorized and tagged 375L, 440, Auto, Basel, Brooklands, Car, Chrysler, Colmar, Fissore, Fura, GALPOT, High, Italia, Luxury 2+2, Magnum, Monteverdi, Peter, Ralphj, Speed on February 6, 2013 by Ralph. 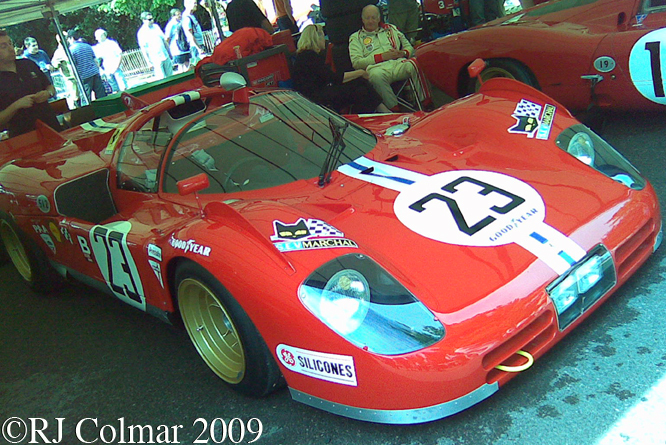 17 Ferrari 512 S’s and parts for 8 others were built in late 1969 in response to the 25 917’s Porsche had built in early 1969 in order to be allowed to race in the World Sports Car Championship which allowed up to 5 litre / 305 cui engines. These rules were introduced so that a few old Ford GT 40’s could continue racing, it was never imagined that Porsche and then Ferrari would build 25 cars each to take part in the series which was intended to be for new 3 litre / 183 cui cars like the Ferrari 312P and Porsche 908. Unlike Porsche who planned on using private works supported teams to run and develop the 917’s on it’s behalf, Ferrari planned on using a single works team to build and develop the 512 S, supplying the rest of the 512 S models to private entrants to whom Ferrari gave little by way of support effectively treating it’s privateer teams as little more than field fillers. Ferrari had to sell his road car operation to FIAT in order finance the production to the 512 S model, and as it turned out Porsche’s private partners had snapped up most of the best drivers. Nonetheless Ferrari took the fight to Porsche with a single championship victory at the 1970 Sebring 12 hours courtesy of Mario Andretti, Nino Vaccarella and Ignazio Guinti driving a 512 S who beat Peter Revson and actor Steve McQueen in their Porsche 908 after Mario famously drove the last 90 mins of the race and chased down an exhausted Peter Revson in what Mario once described as the race of his life. 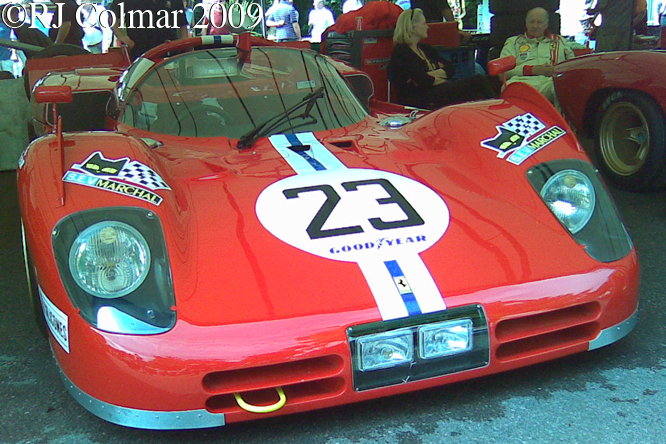 For most of the rest of the 1970 season the Ferrari 512 S was out classed every where, except at the non championship race run at Kyalami in South Africa, by the Porsche 917’s, particularly those of the JW Automotive team. Ferrari had difficulty selling all of it’s 512 S models, where as Porsche had to build a second run of 25 917’s to meet demand. 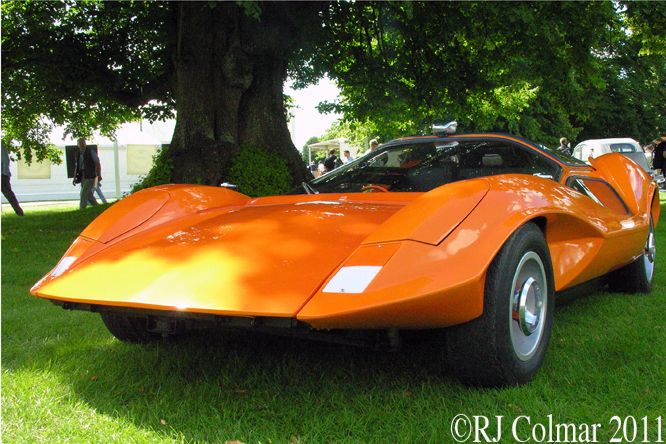 This 512 S spyder, chassis #1006, was developed in order to save 25 kgs by the factory and sold to Luigi Chinetti’s N.A.R.T. team. Ronnie Buchnum and Tony Adamowicz drove it into second place at the 1971 24 hours of Daytona. #1006 had to have both front and rear bodywork replaced during the course of the race, the body work is as it appeared on #1006 when it started the 1971 Daytona 24 hours with aerodynamic lips on the nose, which were not on the second nose fitted when it finished the race. Thanks for joining me on this “Field Filler” edition of “Gettin a li’l psycho on tyres” I hope you will join me again tomorrow for a look at a one off Formula One Lotus that never raced. Don’t forget to come back now. This entry was posted in Uncategorized and tagged 512 S, 908, 917, Adamowicz, Andretti, Buchnum, Car, Colmar, Daytona, Ferrari, Festival, Fiat, Ford, GALPOT, Goodwood, GT 40, Guinti, Ignazio, JW Automotive, Luigi Chinetti, Mario, McQueen, N.A.R.T., Nino, Peter, Porsche, Racing, Ralph, Revson, Ronnie, Speed, Sports, Steve, Tony, Vaccarella, World on January 18, 2013 by Ralph. On March 18th 1967 Shipmaster Pastrengo Rugiati elected to take his charge the 974 ft Torrey Canyon carrying 120,000 tons of crude oil on a disastrous short cut between the Scilly Isles and the Cornish mainland on his way to Milford Haven and ended up causing the worlds largest ship wreck when the boat grounded on the Seven Stones Reef. As the consequent environmental disaster unfolded the ship was bombed sending it 98ft below and the oil spill was repeatedly bombed in a vain effort to keep the oil off the beached of England, France and surrounding islands. In 1969 Peter Wright was working on the ground breaking BRM P142 which would have introduced aerodynamically induced ground effects to racing car design when John Surtees joined BRM and insisted on opting for a conservative approach and developing the existing BRM P138 and P139 chassis with which Big John scored a season best 3rd place driving the P 139 at the 1969 US Grand Prix before quitting BRM to start his own team. 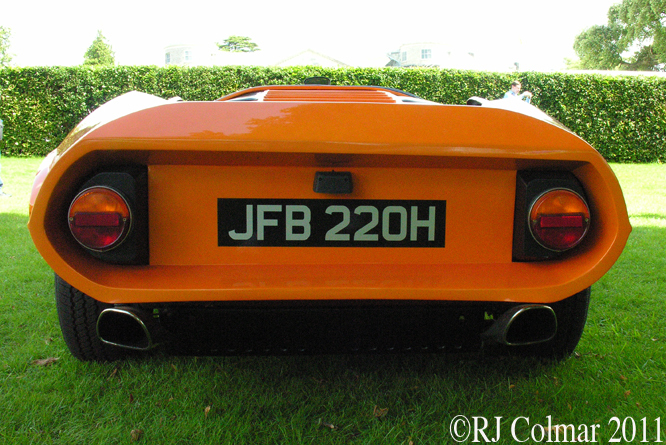 Peter left BRM and some years later started work for Technocraft to develop a vacuum assisted resin injection composite process which was to be used for the manufacture of body shells for the Lotus Elite, Eclat and Esprit road cars and Colin Chapman’s boat companies. After the failure of the Lotus 76 in 1975 Colin Chapman asked another ex BRM employee Tony Rudd, now group engineering director at Lotus, to re-think how a Formula One car might be made to make proper use of the front tyres. Rudd drafted his former colleague Peter Wright in to run the wind tunnel “in his spare time” after his commitments at Technocraft. The fruit of this collaboration was the successful Lotus 78 and world championship winning Lotus 79. The team were not so lucky with the Lotus 80, from which they took a step back with the Lotus 81 before regrouping with their next innovation the twin chassis Lotus 86 seen here. What Peter had found out was that the Lotus 80 and to a lesser extent the Lotus 81 were suffering from aero flutter causing the cars to porpoise as a result of having springs that were too soft for the aerodynamic loads being put through the wheels and suspension. 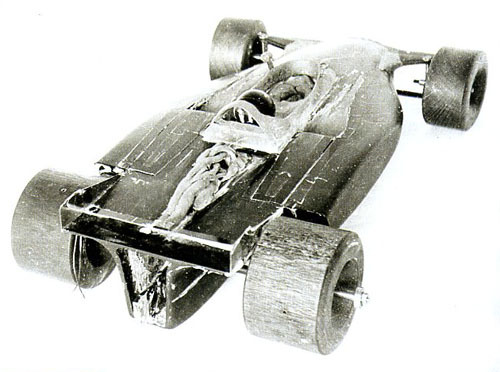 By having a twin chassis Peter hoped to use a conventional monocoque chassis in which the driver sat and a separate independently sprung ground effect chassis attached to the first at the outboard ends of the lower suspension. The suspension for the outer ground effect chassis was much stiffer than for the inner monocoque chassis and as a result in theory should not be quite so sensitive to flutter or likely to porpoise. In order for the car to work not only would the science have to be proven but the rule book scrutinised to ensure the car remained legal. 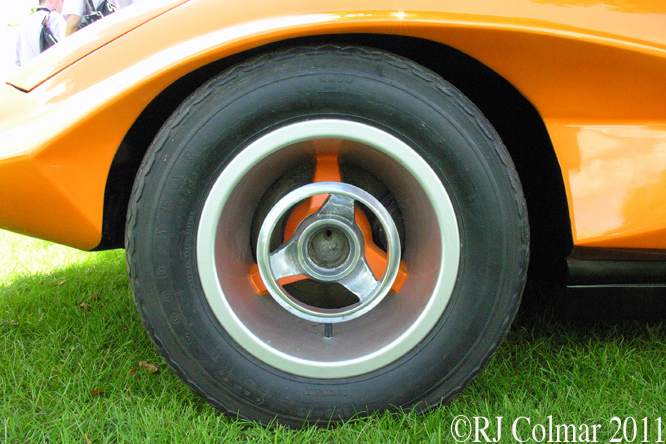 By having the outer ground effect chassis suspended from the bottom suspension links using very stiff rubber bump stops the criteria for having all parts of the car with an aerodynamic influence entirely sprung, was met. To check the science the team took a 1980 Lotus 81 added a spacer between the engine and the fuel tank through which the central cross member of the outer chassis would pass, made provision for the front cross member of the outer chassis to pass under the driver legs and had had the third rear cross member of the outer chassis pass over the gearbox. The weight of the outer chassis was kept low using the in house developed carbon fibre process that Peter had been developing for the Lotus road cars and Champman’s boats. Amid much secrecy the Lotus 86 was built and then taken to Jarama for a private test, thanks to the motors heavily revised oil pumps, that were required by the second chassis, a lot of oil was spilled, hence the Torrey Canyon nick name for the car. Once the leaks had been fixed the Lotus 86 proved that the aerodynamic outer chassis worked providing plenty of down force while the inner monocoque chassis, in which the driver sat, remained free of the porpoising effect that made the car difficult to control. Upon completion of the test the Lotus 86 which was never subsequently raced was put aside and work started on the Lotus 88 using the same principles. Thanks for joining me on this “Torry Canyon” edition of “Gettin’ a li’l psycho on tyres” I hope you will join me again tomorrow for a look at an old Rolls Royce. Don’t forget to come back now ! 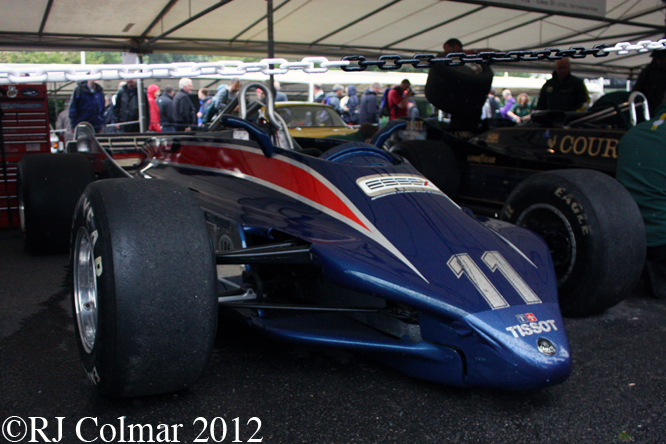 This entry was posted in Uncategorized and tagged 86, BRM, Chapman, Colin, Colmar, Festival of Speed, Ford, GALPOT, Goodwood, Lotus, Martin, Ogilvie, Peter, Ralph, Rudd, Surtees, Technocraft, Tony, Wright on December 22, 2012 by Ralph. 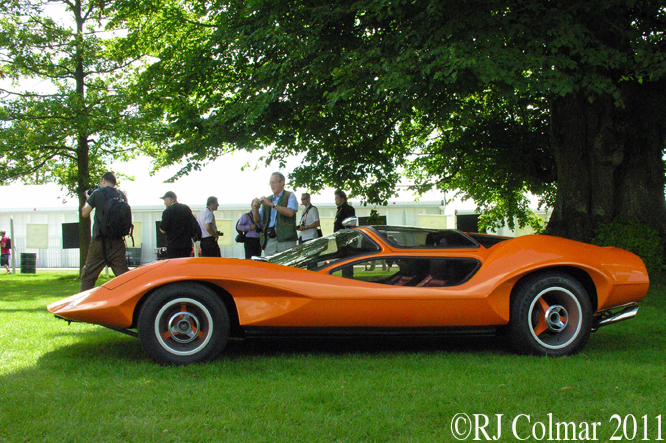 For anyone, like me, who was a kid during the fierce competition to conquer space through the 1960’s part of the vision for the future included mandatory white jump suits, jet packs and incredibly cool cars like the Adams Probe 16 seen here at the Goodwood Festival of Speed earlier this year. 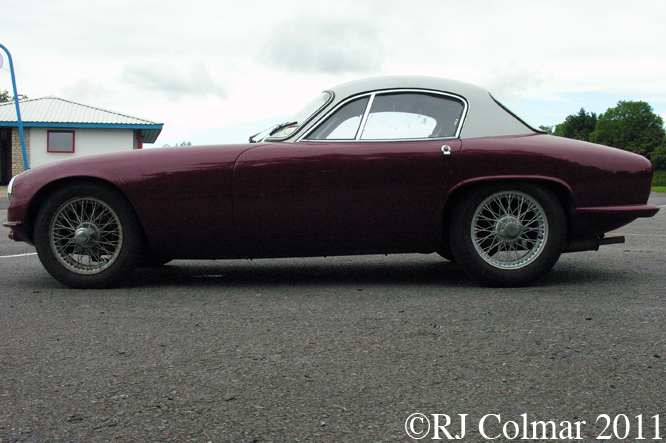 This design came about as a result of an investigation into the extremes of styling by Dennis and Peter Adams who are credited as having introducing a number of modifications to the Marcos GT which became the Marcos Fastback GT. 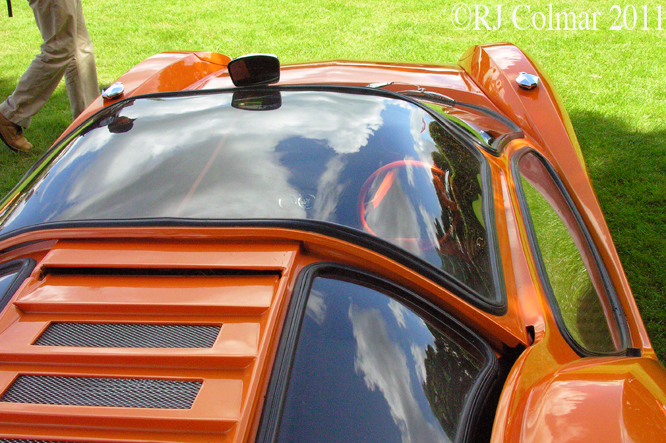 With a roof line at just 34″ above the ground, that is a full 6″ shorter than the Le Mans winning Ford GT 40 which took it’s name from it’s 40″ height, access to the Probe 16 is effected through a slide back glass roof panel. It would appear that the three Probe 16’s were manufactured at the the old Marcos factory at Bradford on Avon in Wiltshire, power came from a mid mounted 4 cylinder motor sourced from, an at the time very common, front wheel drive Austin 1800. 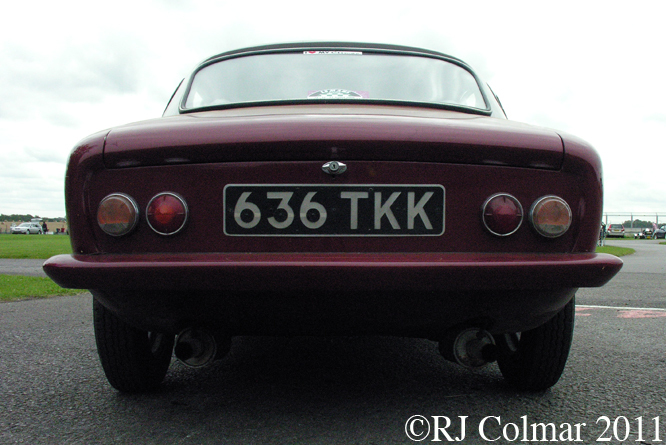 Winning the award for the best British Styling Exercise at the London Motor Show in 1969 did not raise the public profile of this vehicle enough for it to go into volume production. 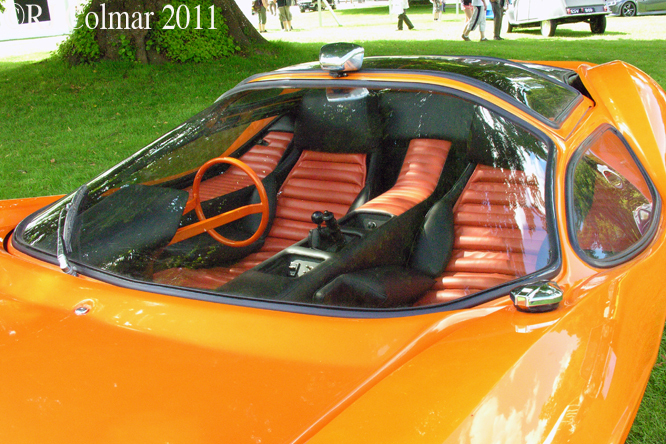 Though four similar Probe 2001’s were manufactured by the Probe Motor Company and WT Nugent Engineering between 1970 and 1972. Up to 48 further vehicles which used some of the Probe 16 body moulds are thought to have been built under the Centaur brand. Of the three original Probe 16’s one went to Wichita Lineman singer song writer Jim Webb, by way of complete contrast another Probe 16 went to Sunshine Of Your Love singer song writer Jack Bruce. Jack passed his Probe 16 on to Mountain drummer on the Nantucket Sleigh Ride Cody Laing. However AB/4 seen here is arguably the most famous of the trio of Probe 16’s having played the role of Durango 95 in the Stanley Kubric ultra violence shock flic A Clockwork Orange. After its flirtation with the silver screen AB/4 spent many years in the Pollock Auto Showcase. AB/4 still painted it’s original yellow, was repatriated in 1987 and featured in the pseudo comedy television series Top Gear at the beginning of the century. More detailed information about all of the Probe 16 related cars can be found on the probe2001.com website, on the linked page some photos of AB/4 can be seen of the car being driven around Brands Hatch. 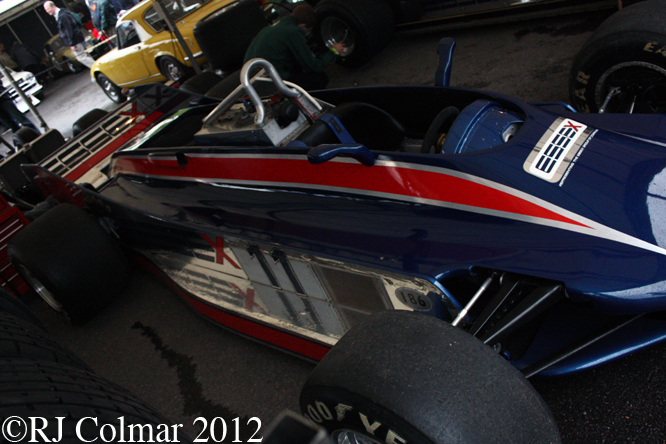 Thanks to The Nostalgia Forum reader MCS the driver of the car at Brands Hatch has been identified as most likely being Ray Allen who immortalised his place in the annals of motor racing history for winning the worlds very first Formula Ford race. My thanks to MCS and everyone else who contributed to the Adams Probe 16 thread at The Nostalgia Forum. Thanks for joining me on this A Clockwork Orange edition of ‘Gettin’ a li’l psycho on tyres’, I hope you will join me again tomorrow. Don’t forget to come back now ! This entry was posted in Uncategorized and tagged 16, 1800, A, Adams, Art, Austin, Clockwork, Dennis, Festival, GALPOT, Goodwood, of, Orange, Peter, Probe, Speed, Tidesco on October 16, 2011 by Ralph. 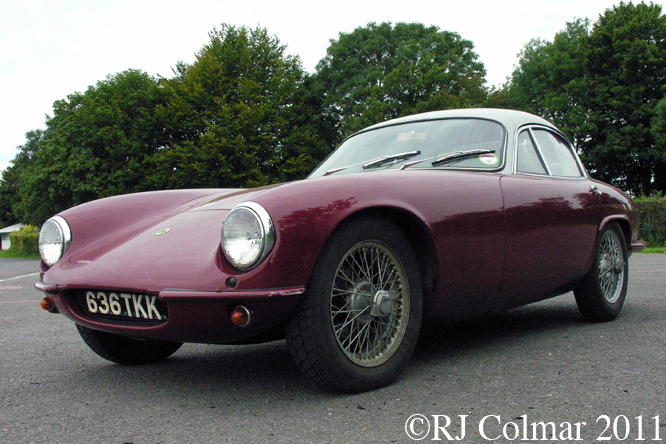 After he had finished with his Lotus VI PGP182 complete with a body of his own design Peter Kirwan Taylor purchased one of the last Doretti sports cars and ‘took the back off’ and turned it into a Coupé too meet his needs. A couple of years later he was talking to Peter Lumsden and Paul Fletcher who planned on compete at Le Mans in 1956 with a Lotus XI and he suggested that they might fair better with a Coupé body. Peter K-T put the idea to Colin Chapman who responded that they would be better starting with a fresh design from scratch with the idea of designing of designing a car that would be competitive on the race track and be a viable proposition for ‘driving to the office’. 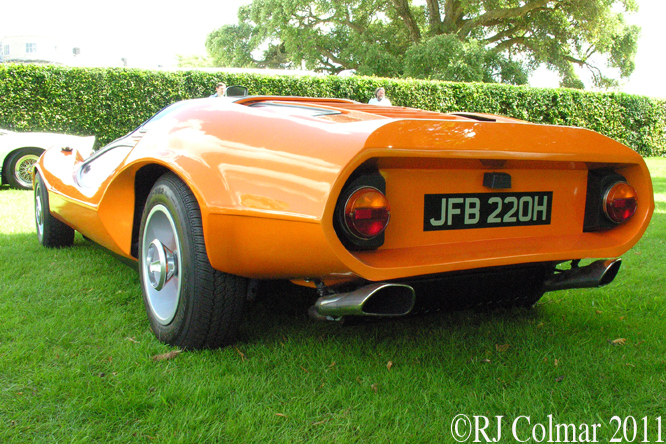 As on his special bodied Lotus VI Peter again opted for designing a car with a high waist line but now with an integral roof influenced by the design of his Doretti Coupé, the design was finalised in collaboration with Frank Costin, who not only had developed a special bodied Lotus Mark VIII but was also an aerodynamicist at the aircraft manufacturer de Havilland where Peter coincidentally was also working in his day time capacity as an accountant. The uncluttered design has a drag coefficient of just 0.29 that compares favourably with vehicles being designed and manufactured today. The Elite, as the new Mark 14 became known, features a glass fibre monocoque with a steel sub frame to carry the engine and front suspension. Power came from a 75 hp Coventry Climax four cylinder engine which was inclined to lower the bonnet / hood line. On the track the Elite was a huge success with six class wins scored at Le Mans, two of them including winning the Index of Thermal Efficiency, former ESPN commentator David Hobbs fitted his with a special 4 speed automatic gearbox took 15 wins from 18 starts during 1961 and ’62 and in the Antipodes Leo Geoghegan won the 1960 Australian GT championship also driving an Elite. 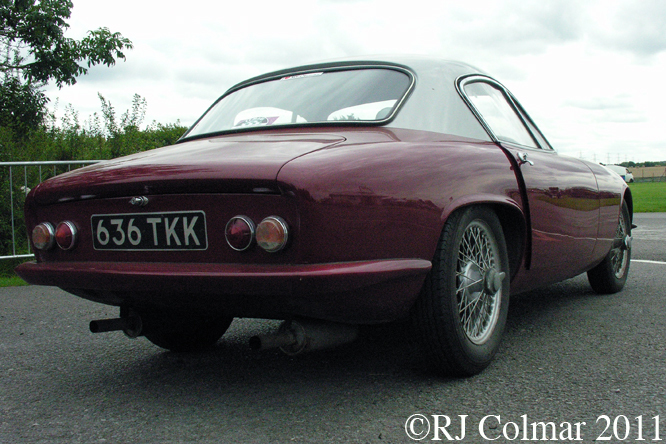 This particular well known example, seen here at Castle Combe, was first registered in 1962 and now belongs to a fellow member of the Bristol Pegasus Motor Club who restored it after it had been lying in bits for 20 years. Thanks for joining me on this second accountants edition of ‘Gettin’ a li’l psycho on tyres’ I hope you will join me again tomorrow when I’ll be looking at an award winning orange movie star. Don’t forget to come back now ! This entry was posted in Uncategorized and tagged 14, Art, Chapman, Colin, Costin, Elite, Fletcher, Frank, GALPOT, Kirwan, Lotus, Lumsden, Mark, Paul, Peter, Taylor, Tidesco on October 15, 2011 by Ralph. In 1942 Peter Kirwan-Taylor was 12 when he returned to England after a temporary evacuation to North America. He accompanied his step father Charles Loraine Hill, a director of Lagonda Cars, on trips to visit Lagonda and Westland the aircraft manufacturer where his interest in design took hold. After a military career, during which he was member of the British Sking team, Peter settled down to follow his fathers footsteps and trained as an accountant. On the April 13th 1954 in between his 3 nights a week studies Peter found time to purchase and build a new Lotus VI, chassis #34, and decided to design his own body for it. He provided Williams & Pritchard with the drawings and a claymodel which featured a high crease line and because of the suspension set up when the body was mounted to the chassis the car accidentally had a futuristic wedge appearance due the forward sloping aspect of the crease line. Peter raced the car several times and as his family and career in finance took off he sold PGP 182 after two years. Thomas Kikaldy owned PGP 182 from 1963 to 1969 and he removed the unique body and sold it to an Italian restaurant owner in London and it has not been seen in public since. In 1983 Len Pritchard, who produced the panels for the original Lotus VI kits, fabricated new panels for PGP 182 in the style of original Lotus VI’s with which the car, seen on this link 4th from right, is fitted today. Peter Ross of the Historic Lotus Register informs me that the whereabouts of the drawings for Peter Kirwan Taylors bodywork are known and his one off body work could be recreated if some one desired. As we shall see next Saturday Peter Kirwan-Taylor’s friendship with Lotus founder Colin Chapman grew from the time he purchased PGP 182 and he would design another Lotus which made a larger mark on the Lotus Cars story. 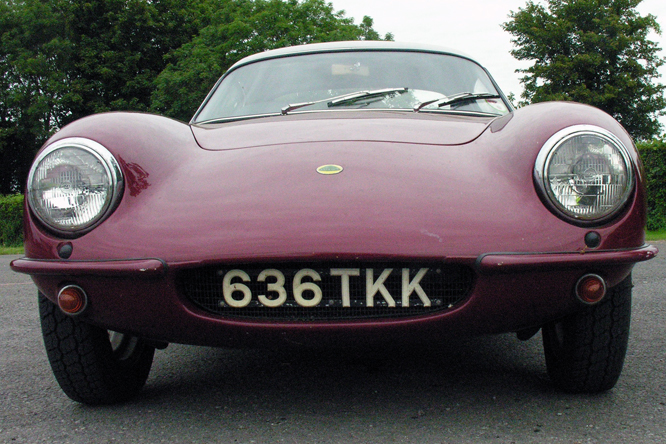 My thanks to Paul Rochdale of The Nostalgia Forum for first identifying PGP 182 as a Lotus VI to Peter Ross from the Historic Lotus Register for details about Peter Kirwan-Taylor and PGP 182 and to Ted Walker aka Ferret Fotographics for permission to use today’s photograph. Thanks for joining me on this accountants edition of ‘Gettin a li’l psycho on tyres’ I hope you will join me again tomorrow. Don’t forget to come back now ! 10/10/11 POSTSCRIPT. Peter Ross of the Historic Lotus Register has kindly sent a few comments about this blog it would appear the photograph in the link is of Ian Duncan at the wheel and the photographer was Tony Wilson Spratt. Peter also informs me that an article ‘The Story of the Kirwan-Taylor bodied Lotus VI’ appeared in the Historic Lotus magazine issue #64 which can be ordered through the HLR website linked here. This entry was posted in Uncategorized and tagged Art, Chapman, Colin, Ferret, Ford, Fotographics, GALPOT, Historic, Kirwin, Lotus, Peter, Pritchard, Register, Taylor, Tidesco, VI, Williams on October 8, 2011 by Ralph.